I live in Washington State. When I tell people that they always say, "Oh, that’s such a pretty state." Which is true, mostly. You see, the Cascade Mountain Range runs down the length of the state from Canada to Oregon cutting the state roughly into a western third and an eastern two-thirds. The Cascades is a barrier geographically, climatologically, culturally, economically, and politically. The Washington State most people think of when they praise its beauty is what those of us living in the rain shadow of the Cascades call "The Wet Side." That's the side with the Seattle metropolitan area, with Puget Sound and the San Juan Islands. That's the side with Mount Rainier, Mount Baker, Mount Adams, Mount St. Helens, and the majestic Olympic Mountains. That's the side that has 78% of the population of the state. That's the side of the state with the headquarters of Fortune 500 companies Microsoft, Costco, and Weyerhaeuser. It's where Boeing builds most of its planes. It's the side with trees and green vegetation. The Eastern two-thirds of the state are quite different. A large part of it is the Columbia Basin that runs roughly from Grand Coulee Dam to the Oregon border, from the Cascades to the rolling, wheat-covered hills of the Palouse. Scrubbed clean by ice age mega-floods (parts are called "The Scab Lands") and in that aforementioned rain shadow, here you only see green vegetation if someone is irrigating it. And there's a lot of irrigation of potatoes, corn, wheat, alfalfa, apples, and grapes for the famous Basin wineries. The economy is mostly agriculture, which lately is paying worse than usual. Then there are the sparsely populated, mountainous counties along the Canadian Border, the farmland of the Palouse in the southeastern corner, and the foothills of the Rockies along the Idaho Border. Spokane is the second largest city in the state, and Spokane County the fourth largest county. 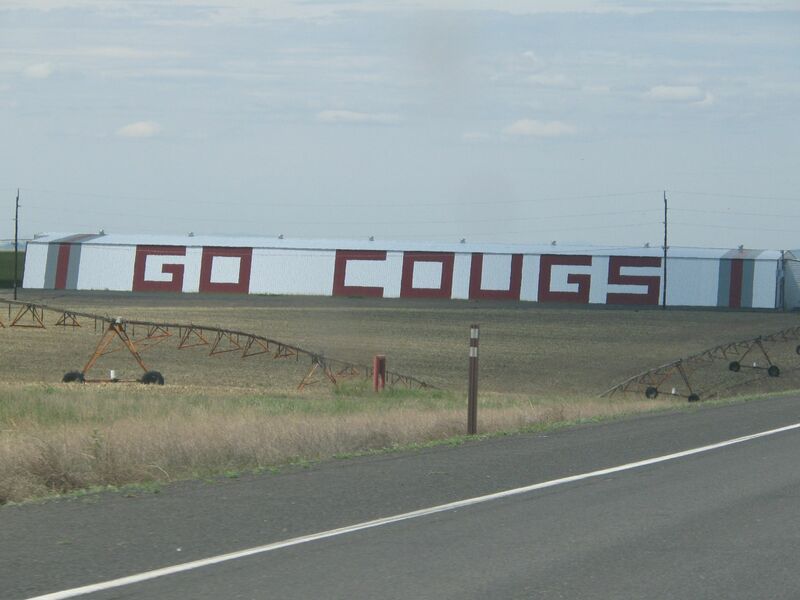 And the east side of the state is "Cougar Country." There are two major universities in Washington State: the University of Washington in Seattle and Washington State University in Pullman. The contrast couldn't be more stark. UW (also known as U-Dub) is in the state's largest city. It is the largest university in the Pacific Northwest. It is considered one of the "Public Ivies" (universities that are public or state owned but are on a par with the Ivy League). It has for decades led the country in research grant dollars. Its medical school is world class. Spokane which is 75 miles due north on slow, two-lane roads. It is 8 miles from Moscow, Idaho (home of the University of Idaho). It is known for its agriculture and animal husbandry programs (which is earned it the nickname "Cow-tech"). And most of the east side of the state is considered "Cougar Country." And the Cougar fans (or simply "Cougars") support their "Cougs" come hell or high water or losing seasons or whatever may come. Even as a UW alum and supporter and fan, I have to admit the Cougs are more virulent in their support of their school. The potato storage pictured at right is an example (this is located along a major east-west highway in Eastern Washington). And I have to admit, the WSU alumni are more supportive. For example, there was a competition that the alumni who donated the most money to Habitat for Humanity got their flag to fly at the top of the Space Needle during the week of the Apple Cup, the annual rivalry football game between the two schools. The Cougs won and not but a small margin. So I live in Cougar Country but I'm a "Husky." And I'm not quiet about it. I have a big purple W on the back window of my car (Husky's colors are purple and gold) and University of Washington licence plates. I often wear Husky T-shirts and polos. And I never lose a chance to tweak some Cougar about their team (assuming the Huskies win the Apple Cup as they did this year). And Cougars never fail to tease me if the Huskies don't win the Apple Cup (like last year). But even in Seattle (home of UW) the aura of support for the Huskies is nothing like it is in Eastern Washington for the Cougs. It's pervasive with crimson clothes, license plates, and the WSU logo (see above) everywhere. In fact, I might be (due to my rebellious streak) more supportive of UW than I otherwise would be because I'm so steeped in WSU support. But it's all in fun. I've yet to meet a Coug who couldn't take good-natured ribbing about their team. And if a Coug gets smart with me I just smile and point out how the Cougars "couged" their first bowl game in 10 years. And I'm looking forward to Friday's Fight Hunger Bowl, when the Huskies will be playing the Cougars (of BYU).